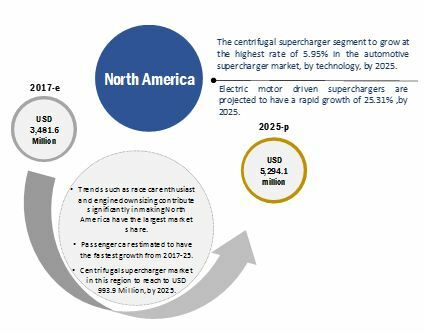 [147 Pages Report] The automotive supercharger market was valued at USD 6.83 Billion in 2016 and is projected to grow at a CAGR of 5.27% during the forecast period, to reach USD 10.95 Billion by 2025. The research methodology used in the report involves primary and secondary sources and follows a bottom-up approach for the purpose of data triangulation. The study involves the country-level OEM and model-wise analysis of automotive supercharger market. This analysis involves historical trends as well as existing market penetrations by country as well as vehicle type. The analysis is projected based on various factors such as growth trends in vehicle production and adoption rate by OEMs. The analysis has been discussed with and validated by primary respondents, including experts from the automotive industry, manufacturers, and suppliers. Secondary sources include associations such as China Association of Automobile Manufacturers (CAAM), International Organization of Motor Vehicle Manufacturers (OICA), European Automobile Manufacturers Association (ACEA), Environmental Protection Agency (EPA), Society of Indian Automotive Manufacturers, SAE International, and paid databases and directories such as Factiva. The ecosystem of the automotive supercharger market consists of manufacturers such as Honeywell (US), Eaton (Ireland), and Valeo (France) and research institutes such as the Japan Automobile Manufacturers Association (JAMA), European Automobile Manufacturers Association (ACEA), Canadian Automobile Association (CAA), and Korea Automobile Manufacturers Association (KAMA). Automotive superchargers are advanced devices that pressurize air into the engine which helps to increase the net power supplied to the vehicle. The power of superchargers is achieved from a belt, which is connected to the engine. Superchargers also increase the rotations per minute of an engine by up to 50,000. There are mainly three different types of superchargers, namely, roots type, twin screw, and centrifugal. 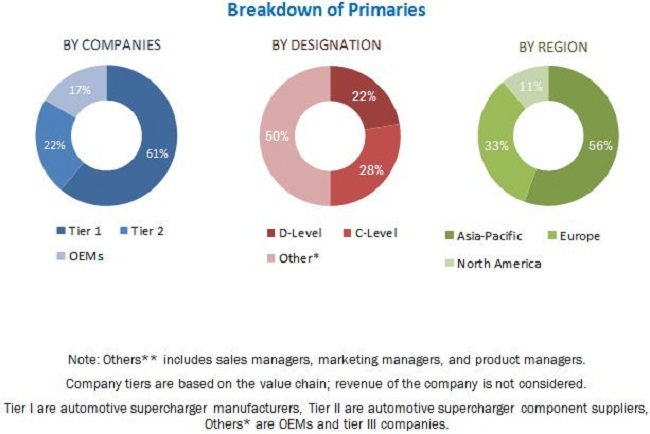 The rising production of gasoline engine vehicles due to strict air emission standards and higher sales of high-end vehicles due to increased disposable incomes worldwide are some of the major factors driving the growth of the automotive supercharger market. The centrifugal supercharging technology is the latest technology in the automotive supercharger market. Hence, the market for this technology is currently low. However, the adoption of centrifugal superchargers by OEMs is increasing at a rapid pace because of the obvious benefits of this technology such as easy installation, smaller size, high efficiency, and low maintenance. Major automotive supercharger players such as Mitsubishi Heavy Industries and Vortech Engineering are now offering several products based on centrifugal supercharging technology. How will the automotive supercharger market cope with the rise in electric vehicle sales? How are OEMs planning to increase penetration of automotive superchargers in economic vehicles without having a significant effect on their price? Will the 48-volt electric supercharger be a success in the electric and ICE vehicles? If not, what alternatives the industry will explore? The centrifugal superchargers compress the air which is to be supplied to the engine with the help of an impeller. This type of supercharger is similar to that of a turbocharger, except that in a turbocharging it uses the engine exhaust gases, whereas in a centrifugal supercharger it uses a belt driven by the crank pulley to spin the impeller. The major advantage of a centrifugal supercharging is that a considerable quantity of air can be delivered by a relatively small size. However, unlike roots and screw superchargers, centrifugal superchargers are good for high rpm range. Centrifugal superchargers find highest application in sports cars or supercars due to their compact size, less maintenance and placement with respect to the engine. The roots type supercharging technology is the oldest technology amongst the other supercharging technologies. Roots superchargers are similar to that of an air pump. Thus, unlike centrifugal and screw superchargers which act as a compressor, roots superchargers act more like an air displacer. These superchargers are placed on the top of the engine and they look attractive when seen hanging from the hood. Roots superchargers promise a drastic increase in power at lower RPMs. Major supercharger manufacturers such as Eaton solely offer roots superchargers. The twin-screw type superchargers are advanced versions of roots superchargers and thus look identical to them from the outside. But, from inside there is a twin-screw design which helps to compress the air flow. The twin screw has a fill side and a discharge side. Thus, when air is moved from the fill side to the discharge end, the air pockets decrease and get squeezed by the rotor lobes and are compressed into the engine. With this technology, the twin-screw superchargers become more efficient, and are a bit expensive than the roots superchargers, because the screw-type rotors require more precision in the manufacturing process. Since superchargers are mainly seen in high end or racing vehicles? Would targeting of the economic or low-end vehicles a success or a challenge? Will the suppliers continue to explore new avenues for automotive superchargers effectiveness? 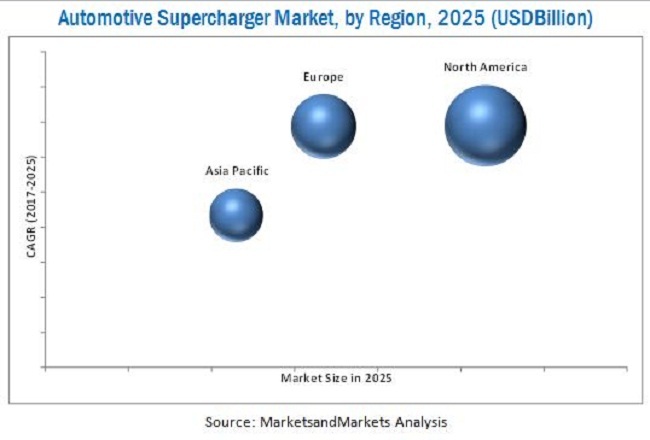 Which geographical markets are unexplored in the automotive supercharger market where there is a good growth potential?